The Best Festival blogs from thousands of top Festival blogs in our index using search and social metrics. Data will be refreshed once a week. Facebook fans 1,161,366. Twitter followers 519,083. Mountain View, CA About Blog Comprehensive up-to-date news coverage, aggregated from sources all over the world by Google News about festival. Facebook fans n/a. Twitter followers 213,640. Washington, D.C. About Blog Stories from the Smithsonian Folklife Festival in videos, songs, interviews, and more. Facebook fans 20,807. Twitter followers 9,312. Aspen, CO About Blog The Aspen Ideas Festival is dedicated to Engaging Ideas that Matter through the annual Aspen Ideas Festival, conversations, video, and more. Facebook fans 33,320. Twitter followers 29,381. Berlin, Germany About Blog FilmFestivalLife's Blog: your daily digest of festival stories, tips, tutorials, news and insights of the film festival world. Facebook fans 6,790. Twitter followers 7,800. Facebook fans 225,302. Twitter followers 207,118. Melbourne, Australia About Blog Throughout the years, Melbourne Writers Festival has been host to some of the greatest writers and thinkers from Australia and around the world. Facebook fans 20,814. Twitter followers 27,412. Woodfordia, Australia About Blog Woodford is an iconic Australian festival. It's an annual pilgrimage for thousands of people from all over Aust & the world. Facebook fans 100,703. Twitter followers 5,792. Austin, TX About Blog AFF furthers the art and craft of film by inspiring and championing the work of all artists who use the language of film and television to tell a story. Facebook fans 60,271. Twitter followers 29,764. Atlanta, GA About Blog The official blog of the A3C Hip Hop Festival. A3C (All 3 Coasts) Festival & Conference engages and inspires the artists, entrepreneurs, and creatives that shape hip-hop culture. Facebook fans 55,546. Twitter followers 31,545. Oxford, MS About Blog The Oxford Film Festival celebrates the art of independent cinema. Through year round programming, the festival works to encourage filmmaking in Oxford and North Mississippi while growing understanding of cinema through screenings, workshops and educational programs, culminating in the annual five day festival. Facebook fans 7,994. Twitter followers 6,351. Cedar City, UT About Blog The Utah Shakespeare Festival presents life-affirming classic and contemporary plays in repertory, with Shakespeare as our cornerstone. These plays are enhanced by interactive festival experiences which entertain, enrich, and educate. Facebook fans 14,761. Twitter followers 2,585. About Blog A festival of the humanities. Being Human aims to engage the public with the very best of the innovative research taking place across the humanities. Hosted by HE institutions and their cultural and community partners across the UK. Facebook fans 111. Twitter followers 8,018. Santa Barbara About Blog An open-source transformational art and music festival near Santa Barbara, CA. Facebook fans 128,631. Twitter followers 4,197. Beale Park, near Reading, UK About Blog A camping yoga festival bringing together the true masters of Yoga and Meditation. Facebook fans 6,086. Twitter followers 534. All across the UK About Blog The UK's largest grassroots music festival made up of hundreds of music events all across the UK. Facebook fans 9,111. Twitter followers 11,270. Edinburgh About Blog Hidden Door will return 25 May - 3 June 2018 to the glorious Leith Theatre and abandoned State Cinema, for 10 days of music, visual art, theatre, cinema, spoken word, dance, late night DJs, special events and more. Facebook fans 16,385. Twitter followers 6,889. Italy About Blog Radicepura Garden Festival is the first international event dedicated to Mediterranean garden design and landscape architecture. Facebook fans 6,230. Twitter followers 741. Vancouver, BC - 1181 Seymour About Blog The Official Blog of the Vancouver International Film Festival and Vancity Theatre. The festival's mission is to encourage the understanding of other nations through the art of cinema, to foster the art of cinema, to facilitate the meeting in British Columbia of cinema professionals from around the world, and to stimulate the motion picture industry in British Columbia and Canada. Facebook fans 33,200. Twitter followers 28,973. About Blog Festival Wedding Inspiration for Free Spirited BridesA cool and alternative UK wedding blog focusing on festival wedding inspiration, bohemian style ideas and quirky suppliers for free spirited brides and grooms. Facebook fans 12,356. Twitter followers 10,984. Dover, DE About Blog Firefly Music Festival is a premier music experience set among lush wooded landscapes, featuring renowned headliners and emerging artists. Witness unforgettable performances and discover the engaging attractions nestled around every turn that make Firefly a can’t-miss summer tradition for music fans from around the world. Facebook fans 244,051. Twitter followers 121,587. Salmo, BC Canada. About Blog Annual Electronic Music Festival in Salmo, BC. This is Canada’s premiere Electronic Music Festival. Cutting edge Talent, Lights and Sound come together in Paradise to give life to a non -sponsored family run anomaly. Seeing it for yourself is the only way to understand exactly what is Shambhala. Facebook fans 164,945. Twitter followers 21,193. Swindon, UK About Blog Shaping Society. UK's main organisation for funding research and training in economic and social sciences. Facebook fans 6,163. Twitter followers 52,815. Thiruvananthapuram About Blog International Film Festival of Kerala has a competition section for films from the Asian, African and Latin American films. The non competition section includes inter alia contemporary world cinema and films of great masters. Facebook fans 23,842. Twitter followers 255. Pittsburgh, PA About Blog The Thrival Innovation Music Festival is a dynamic, inclusive platform for advancing forward-thinking ideas and showcasing groundbreaking musical talent in order to support a culture of innovation, entrepreneurship, and creative energy in the Pittsburgh region. Facebook fans 7,815. Twitter followers 11,108. Facebook fans 16,340. Twitter followers 1,049. Indianapolis About Blog Inspiring filmmakers & audiences through the transformative power of film. Nonprofit arts organization inspiring filmmakers and audiences through the transformative power of film. Heartland Film Festival. Facebook fans 12,102. Twitter followers 7,943. East Hampton, NY About Blog The Hamptons International Film Festival was founded to celebrate Independent film—long, short, fiction and documentary—and to introduce a unique and varied spectrum of international films and filmmakers to our audiences. Facebook fans 9,567. Twitter followers 7,550. Tavistock Institute TIHR About Blog Reimagining Human Relations in Our Time is a festival celebrating 70 years of the Tavistock Institute. Facebook fans 4,707. Twitter followers 452. Fort Lauderdale Beach, FL About Blog Music festival for Fort Lauderdale Beach, FL. Cleveland, Ohio About Blog Ohio Festivals is a blog used to record my festival-related adventures to aid potential festival-goers or anyone affiliated with festivals . Facebook fans 24,436. Twitter followers 3,456. Berlin About Blog Berlin fashion Film Festival is an intimate experience for creatives from the film, advertising and style industries. Every year BFFF brings together top creatives and thought-leaders to present and award the best film productions on lifestyle, beauty and fashion. Facebook fans 13,718. Twitter followers 4,668. About Blog Off the Shelf is one of the largest literary festivals in the UK. Every year we bring the biggest names in literature and arts to Sheffield. London, UK About Blog London Screenwriters' Festival: Educate, inspire and connect. Facebook fans n/a. Twitter followers 13,927. Toronto, Canada About Blog Bringing together the world’s best writers of contemporary literature. IFOA presents the finest international novelists, poets, playwrights, short story writers and biographers, and provides Canadian writers with an internationally recognised forum in which to present their work. Facebook fans 2,861. Twitter followers 10,814. Zrce Beach, Croatia About Blog 5 days and nights, 5 open air venues. Pool, boat and beach parties all on Zrce Beach, Croatia. Facebook fans 189,327. Twitter followers 46,270. About Blog Pittsburgh Renaissance Festival takes you on a magical tour through time and legend! Facebook fans 21,954. Twitter followers n/a. About Blog Fierce Festival is one of the UK’s most respected festivals of Live Art & the leading organisation for Live Art in the West Midlands. Facebook fans 4,471. Twitter followers 7,472. About Blog The county seat Eschwege turned into a pilgrimage city for festival goers who are looking for a different flair ... the Open Flair. Australia About Blog The National Young Writers' Festival is an annual festival for young writers held in Newcastle, NSW. Facebook fans 4,001. Twitter followers 5,823. Jackson Hole, WY About Blog The Jackson Hole Wildlife Film Festival is dedicated to promoting public awareness and stewardship of wildlife and wildlife habitat through the innovative use of media. Pursuing our mission of connecting people to the natural world through media with events, industry conferences & film competitions. Facebook fans 4,955. Twitter followers 4,678. Kolkata, India About Blog CICFF is a monthly live screening film festival, with an annual live screening mega event in the City of Joy. Get updated news of various International film festival through CICFF. Read various news about film industry worldwide. Facebook fans 8,898. Twitter followers 265. About Blog Interfusion Festival is the largest movement and healing arts fusion event in the US. It is a community-funded grassroots effort to elevate collective consciousness and spread healing through arts. Facebook fans 27,294. Twitter followers 6. London About Blog Eclectic, engaging and unforgettable. Eight weeks of underground arts & entertainment. Facebook fans 8,014. Twitter followers 10,129. Vancouver, BC About Blog Home of the TD Vancouver International Jazz Festival, the best concerts and events in Vancouver, learn what is happening today. The festival brings audiences face to face with the most exciting and creative music the world has to offer. Facebook fans 7,908. Twitter followers 11,933. Worldwide About Blog International Kadampa Festivals, Empowerments, Teachings and Retreats on Modern Buddhism. Facebook fans 20,568. Twitter followers 11,219. Ilkley, West Yorkshire, UK About Blog The North's liveliest and most prestigious Literature Festival. Facebook fans 4,247. Twitter followers 6,336. Austin, TX About Blog Other Worlds Austin is one of the premier SciFi Film Festivals in the US, championing filmmakers and writers and bringing the best films to the Geek Capital of the World. With a diverse and approachable team of programmers, we are building a network of SciFi fans and filmmakers, leading a loyal community, and launching SciFi films into the wider world. Facebook fans 2,147. Twitter followers 24,732. Gilroy, CA About Blog The Gilroy Garlic Festival started in 1979 and is now known across the globe as summer’s ultimate food fair, with three full days of great garlicky food, live entertainment, and family fun. Facebook fans 47,478. Twitter followers 1,998. The Peak District, Derbyshire About Blog 3 days of quality music, food & drink, performing arts, comedy, workshops & good times in a stunning . Facebook fans 75,298. Twitter followers 43,987. About Blog For 17 days and nights each spring, Spoleto Festival USA fills Charleston, South Carolinas historic theaters, churches, and outdoor spaces with over 120 performances by renowned artists as well as emerging performers in disciplines ranging from opera, theater, music theater, dance, and chamber, symphonic, choral, and jazz music, as well as the visual arts. Facebook fans 18,938. Twitter followers 11,857. Toronto, Canada About Blog Toronto Design Offsite Festival is an annual city-wide platform for the exhibition and engagement of independent design in Toronto. Facebook fans 21,011. Twitter followers 3,982. About Blog The Emerging Writers’ Festival is a not-for-profit organisation whose foundations are built on supporting emerging writers. We are a place where creativity and innovation are celebrated, where new talent is nurtured and where diverse voices from across Australia are represented. Facebook fans 14,659. Twitter followers n/a. London, England About Blog The Service Design Fringe Festival runs alongside the London Design Festival (LDF) to showcase the game-changing work that service designers are doing in London. Facebook fans 922. Twitter followers 1,176. Cambridge, UK About Blog Watersprite is the Cambridge International Student Film Festival, now in its eighth year. We are all about recognising and rewarding emerging talent. We showcase the best student shorts alongside free events from industry-leading speakers. Facebook fans 3,906. Twitter followers 2,098. Glasgow, Scotland About Blog Document Festival is Scotland’s international human rights documentary film festival, established in 2003. It provides a unique platform that attracts Scottish, British and international documentary filmmakers and promotes local and international discussion, cultural exchange and education. Facebook fans 4,597. Twitter followers 1,638. San Diego About Blog Horrible Imaginings Film Festival & Podcast explores, exhibits, and celebrates art and film that expresses the darker aspects of the human condition. Facebook fans 4,744. Twitter followers 3,094. Indianapolis, IN About Blog A nonprofit organization producing life-enriching events & programs for Indianapolis and Indiana that celebrate the spirit & legacy of the Indianapolis 500. Facebook fans 20,575. Twitter followers 13,174. About Blog Poker, cash games, travel, fun poker festivals. Chemainus, BC, Canada About Blog We are a vibrant, established and fully professional theatre nestled in the seaside community of Chemainus, BC. We feature some of the finest performers and performances in Canada. Facebook fans 3,324. Twitter followers 1,311. Peterborough About Blog Articles on Golazo cycling Festival. Facebook fans 10,982. Twitter followers 2,134. Ojai, CA About Blog Contemporary Classical Music Festival in Ojai, CA. A place for the curious to listen, feel and think. Facebook fans 5,140. Twitter followers 5,094. About Blog Wine Island is a brand new Sydney Wine Festival that will transform Clark Island on Sydney Harbour into a wine lovers paradise. Facebook fans 8,428. Twitter followers 278. Byron Bay About Blog The Festival provides a forum for intelligent discussion and guests are invited to address the issues that matter to them as writers and which necessarily concern us all. Facebook fans 6,251. Twitter followers 3,494. Vancouver About Blog A music festival blog featuring stories, interviews, new music, photos and videos on festival culture, music trends and events. Facebook fans 3,827. Twitter followers 1,289. Facebook fans 1,721. Twitter followers 2,350. London, England About Blog This festival is about bringing some of our favourite drinks into one place for everyone to try. Whether you are on a health kick, moderating your drinking habits, pregnant or trying, or just a bit sober curious, this is your chance to find a new favourite tipple. Facebook fans n/a. Twitter followers 2,415. PSU/State College, PA About Blog Central Pennsylvania Festival of the Arts, aka Arts Festival, brings over 125,000 people to State College and Penn State each July to celebrate the arts! Facebook fans 12,695. Twitter followers 1,571. About Blog We are your global festival guides. Discover some of the best, weirdest and most underground festivals in Canada, Australia and other pockets around the globe. Facebook fans 1,134. Twitter followers 299. About Blog Festination is your No1. source when it comes to music festivals. Find events all over the world, buy tickets, book accommodation, and have fun! Facebook fans 43. Twitter followers 56. Caboolture - north of Brisbane About Blog The Abbey Medieval Festival is the largest authentic medieval festival in the Southern hemisphere and is a premier event in the Moreton Bay Region. Facebook fans 30,358. Twitter followers 756. Toowoomba, Queensland About Blog Cully Fest is an annual Folk Festival held in Queensland. The festival will continue to give visitors a unique opportunity over three days and three nights to immerse themselves in music, arts, rodeo and creative activities including Outback and Aboriginal cultures and traditions like never before. Facebook fans 3,173. Twitter followers 71. Durham, UK About Blog The North East's biggest literary event. Author talks, readings, performances, new commissions and the announcement of the Gordon Burn Prize. Facebook fans 1,735. Twitter followers 5,324. Greenwich, CT About Blog The mission of the Greenwich International Film Festival is to provide filmmakers with an effective platform to showcase their work with the goal of finding financing and distribution. Facebook fans 13,258. Twitter followers 43,518. Listowel Co Kerry Ireland About Blog Listowel Writers’ Week is an internationally acclaimed literary festival devoted to bringing together writers and audiences at unique and innovative events in the historic and intimate surroundings of Listowel County Kerry. Facebook fans 13,043. Twitter followers 5,205. Glasgow, Scotland About Blog The Havana/Glasgow Film Festival brings the very best of Cuban cinema to Havana's Twin City, Glasgow. Facebook fans 1,894. Twitter followers 467. Conway, NH About Blog Since its inception 22 years ago this event has been eagerly anticipated by ice climbers in the Eastern United States and is considered one of the premier climbing events in the country. Facebook fans 3,011. Twitter followers 208. London, England About Blog A host of exciting events are happening in the Dulwich Festival this year. From wonderful walks to beautiful voices, from art in hidden spaces to music in unusual spaces, there will be something to make everyone feel at home. Facebook fans 1,236. Twitter followers 4,248. Facebook fans 1,571. Twitter followers 93. Club Soda About Blog Montreal Burlesque Festival - Burlesque Festival in Montreal, Canada, featuring top Burlesque performers from Canada and around the world! Along with regular performances in Quebec, our fringe festival is also available in Vancouver, Toronto and US cities. Facebook fans 10,089. Twitter followers 899. Brooklyn, NY About Blog Founded in 2011, AoBFF is the only independent, international festival in the world exclusively focused on Brooklyn film and media. Facebook fans 3,906. Twitter followers 2,129. Wollongong, NSW, Australia About Blog Community arts, author panels, workshops, music, discussions, and spoken word in Wollongong. Facebook fans 1,752. Twitter followers 766. Goring & Streatley About Blog The GAP Festival is a celebration of music (of many kinds), literature, visual and performing arts, with talks, demonstrations, workshops and Fringe events that bring people together to explore new ideas and to be surprised and delighted by what emerges. Facebook fans 540. Twitter followers 243. Austin, Texas About Blog We connect, support and inspire film community in Austin, TX, by building the bridge between American and Polish filmmakers. Facebook fans 703. Twitter followers 131. About Blog The happy wanderer festival has evolved from working bees held over the last few years at this really special farm. It's about connecting people with the farm and the north east region generally. It's about getting the best bunch of people together- building community. Facebook fans 2,399. Twitter followers n/a. Derby, UK About Blog Bringing Books to Life. The festival aims to bring Derby’s residents together in a love of books and inspire a new generation of readers. Facebook fans 1,656. Twitter followers 2,686. Hay-on-Wye, Wales About Blog Founded in 1987 around a kitchen table in Wales, Hay Festival is a nonprofit that brings readers and writers together to share stories and ideas in sustainable events around the world. Facebook fans 34,575. Twitter followers 49,303. Miami, FL About Blog The mission of the Miami Film Festival is to bridge cultural understanding and encourage artistic development and excellence by provoking thought through film. Facebook fans 44,266. Twitter followers 24,837. Wisconsin About Blog Country Fest is the largest 3-Day Country Music & Camping Event in the US. Country Fest'ers enjoy amazing music and entertainment, RFID wristbands, cashless option in the concert grounds, delicious food, interactive exhibits, exciting activations and the largest campground in WI. Facebook fans 130,601. Twitter followers 8,536. London, England About Blog Music Festival News, award-winning festival news website. Line up announcements, tickets, playlists, reviews, competitions and information. Facebook fans 5,028. Twitter followers 46,450. St Andrews, Scotland About Blog StAnza, Scotland's Poetry Festival, is held every March in St Andrews, Scotland's oldest university town. With readings, exhibitions, performances, music, film and children's events, all in exciting and atmospheric venues, StAnza celebrates poetry in all its many forms. Facebook fans 2,137. Twitter followers 12,509. Southern Utah About Blog Welcome to Utah UFO Festival This is not an ordinary UFO Conference. We are completely outdoors with camping included and we want to hear about your UFO experiences and stories. We are a truly grass-roots festival which means that we are building this from scratch. Facebook fans 678. Twitter followers 9,400. Ireland About Blog Committed to presenting a unique programme covering all art forms to a wide audience, this major annual event contributes significantly to the economic, social, cultural & artistic life of the town. Facebook fans 2,827. Twitter followers 2,768. Facebook fans 3,007. Twitter followers 4,128. NewcastleGateshead About Blog Juice Festival, NewcastleGateshead’s annual festival celebrating the creativity of children and young people, returns this autumn half term for nine days of events, performances and experiences produced by, for and with children and young people. Facebook fans 3,117. Twitter followers 5,038. Southampton About Blog SO: To Speak: Southampton's Festival of Words was created by Southampton Festivals to celebrate and promote the talent and creativity in the city in theatre, literature and writing, Spoken Word, flash fiction and film. Facebook fans 1,091. Twitter followers 840. Bellingham, WA About Blog The annual CASCADIA International Women's Film Festival presents incredible films directed by women plus workshops, industry panels, and events year round. Facebook fans 638. Twitter followers 357. Borrego Springs, CA About Blog The Borrego Springs Film Festival goal is to provide a viable venue for independent film makers to display their work and to provide discussion panels encouraging interaction between the artists and the viewing audience exploring the complex world of film making. Facebook fans 833. Twitter followers 235. Scotland, United Kingdom About Blog After organising a hugely successful Whisky and Women event as part of the Audacious Women Festival, we're now bringing a whisky festival to the Kingdom of Fife. Facebook fans 303. Twitter followers 345. Wetherby, England About Blog Art festival which people still think it a splendid idea to bring the community together and attract people to our town. Vancouver, British Columbia About Blog Vines connects artists & audience through creativity in nature acknowledging the significance of self expression & the power of the natural world. About Blog Puppets Occupy Street Festival is the first art animation festival in Romania that takes place exclusively in unconventional spaces, created for the community; brings together private theater companies and independent artists from Romania and abroad, thus encouraging public-private partnership. Facebook fans 2,618. Twitter followers n/a. About Blog The Bridge Film Festival provides a forum for dialog, learning, and exchange of ideas of commonality and diversity. Serving student filmmakers across an international network of Quaker educational institutions, the festival is committed to nurturing purposeful filmmaking that communicates messages of conscience. Guided by the Quaker principles of truth, community, equality and peace. Facebook fans 179. Twitter followers 476. 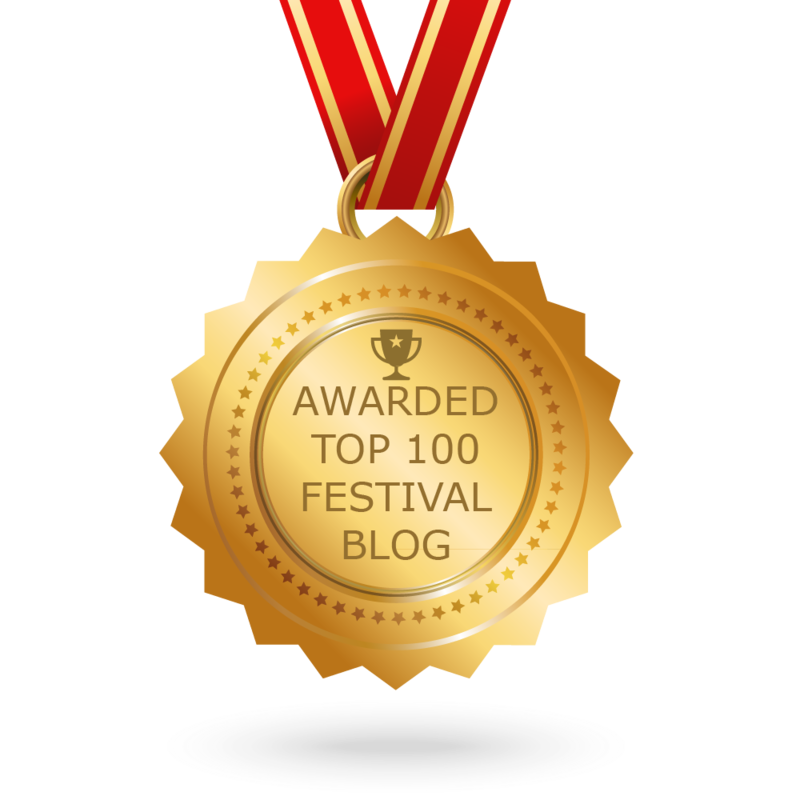 CONGRATULATIONS to every blogger that has made this Top Festival Blogs list! This is the most comprehensive list of best Festival blogs on the internet and I’m honoured to have you as part of this! I personally give you a high-five and want to thank you for your contribution to this world.